At least 18 people in the U.S. and 11 in Canada are confirmed as part a Listeria monocytogenes outbreak that spans at least seven months and is linked to packaged salads from Dole. 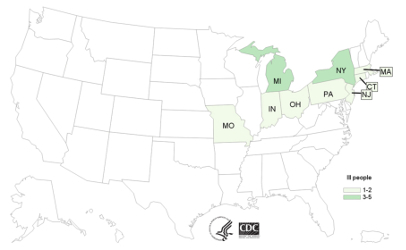 Three more people have been confirmed as victims of the seven-month Listeria monocytogenes outbreak linked to packaged salads from a Dole Food Co. plant in Ohio. The case count in the U.S. is now 18 people across nine states. All 18 required hospitalization and one in Minnesota died, according to an update from the Centers for Disease Control and Prevention. Canadian officials haven’t updated numbers for their country since Feb. 2 when there were 11 cases across five provinces. Officials from Dole’s West Lake Village, CA, headquarters did not immediately respond to requests for comment on the outbreak, which is linked to salad products only from the company’s Springfield, OH, packaging plant. Products from that facility have identifying codes that begin with a capital letter A.
Dole shut down the Ohio facility on Jan. 21. On Jan. 2 the company recalled all products distributed from that facility. It is not known if Dole has resumed operations there. “The investigation began in September 2015, (but) the source of these illnesses wasn’t known until January 2016 when a laboratory result from a packaged salad collected in Ohio linked the illnesses to the Dole processing facility in Springfield,” according to the CDC. “Whole genome sequencing has been performed on clinical isolates from all ill people and has shown that the isolates are highly related genetically. Listeria specimens were collected from ill people between July 5, 2015, and January 31, 2016. Ill people range in age from 3 years to 83,” the CDC reported. ORIGINAL POST: January 22, 2016 at 4:50 p.m.
Dole is voluntarily recalling its pre-bagged salads produced at its Springfield, OH facility after a listeria outbreak sickened 12 people and killed one, NBC News reports. According to the Centers for Disease Control and Prevention, the outbreak was reported in six states since July 5, but the source of the illnesses wasn’t known until January. Investigators found that the outbreak was linked to the packaged salads from the Ohio plant, that were sold under brands like Dole, Fresh Selections, Simple Truth, Marketside, The Little Salad Bar, and President’s Choice. The CDC recommends that you don’t eat, serve, or sell salads processed at that plant, and says there’s no evidence that any other Dole facilities were affected. The salads were sold in 23 U.S. states and three Candian provinces, and you can view the full list of affected areas here. If you’re unsure whether your bagged salad is affected, check the manufacturing label and see if there’s a letter A at the beginning. If so, you should throw away your salad. Symptoms of listeriosis include fever, muscle aches, and gastrointestinal distress, and primarily affects older people, newborns, pregnant women, and people with weakened immune systems. Infections in pregnant women can lead to miscarriage, stillbirth, premature delivery, or infections in the newborn baby. If you have any questions about the recall, call Dole’s customer response line at 1-800-356-3111 from 8 a.m. to 8 p.m. Eastern time, Monday through Friday.